101 roll film 1895 1956 3½" × 3½"
103 roll film 1896 1949 3¾" × 4¾"
104 roll film 1897 1949 4¾" × 3¾"
107 for roll holder 1898 1924 3¼" × 4¼"
108 for roll holder 1898 1929 4¼" × 3¼"
109 for roll holder 1898 1924 4" × 5"
(early roll film) for roll holder 1898 1929 5" × 4" No relation to the later 110 cartridge format. 111 for roll holder 1898 Unknown 6½" × 4¾"
112 for roll holder 1898 1924 7" × 5"
115 roll film 1898 1949 6¾" × 4¾"
119 roll film 1900 1940 4¼" × 3¼"
120 roll film 1901 Present 2¼" × 3¼"
121 roll film 1902 1941 1⅝" × 2½"
123 roll film 1904 1949 4" × 5"
(early roll film) roll film 1906 1949 4¼" × 6½" No relation to the 126 cartridge format introduced in 1963. Introduced with first "Instamatic" cameras under the name "Kodapak"
127 roll film 1912 Present 1⅝" × 2½"
16 46 mm stock, "Vest Pocket"
130 roll film 1916 1961 2⅞" × 4⅞"
220 roll film 1965 Present 2¼" × 3¼"
526 film pack 1920 1941 4¾ × 6½"
Super 16 (Rollei) cartridge 1963 1981 13 × 17 mm 18 Rollei, 16 mm stock, perforation on both edges? ^ Unless otherwise noted, all formats were introduced by Kodak, which began allocating the number series in 1913. Before that, films were simply identified by the name of the cameras they were intended for. For roll holder means film for cartridge roll holders, allowing roll film to be used with cameras designed to use glass plates. 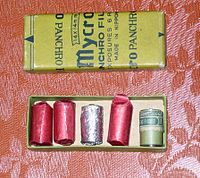 These were spooled with the emulsion facing outward, rather than inward as in film designed for native roll-film cameras. Types 106 to 114 were for Eastman-Walker rollholders, while types 50 to 54 were for Graflex rollholders. The primary reason there were so many different negative formats in the early days was that prints were made by contact, without use of an enlarger. The film format would thus be exactly the same as the size of the print—so if you wanted large prints, you would have to use a large camera and corresponding film format. ^ The History of Kodak Roll Films. [January 10, 2016]. （原始内容存档于22 February 2009）. ^ What is 110 film?. lomography.com. 2012-05-16 [2015-09-14]. ^ The Ensignette Camera. [19 October 2011]. ^ Ilford History and Chronology. [20 June 2011]. ^ Reloading Hit Cameras. [23 October 2011]. ^ 17.5mm or "Hit" Style Cameras. [23 October 2011].